Anesthesiology is an exciting field of medical practice. Few other opportunities in medicine allows for such rapid clinical decisions, and often immediate results from your clinical interventions. It is a field mixed with stimulation and challenge of the intellect, as well as technical expertise for procedural skills. The ability to communicate with the patient and set them at ease is an integral role for the anesthesiologist, as patients present for a spectrum of minor to life threatening procedures. 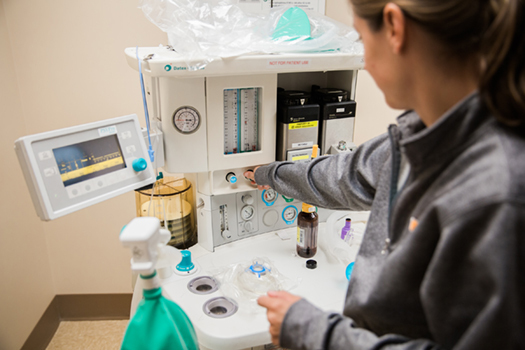 An anesthesia residency program has the challenge of providing opportunities that enable a physician to acquire necessary medical knowledge, become proficient at technical procedures, and develop the interpersonal skills for communicating with colleagues and patients. As the sole Level-1 trauma center in Eastern Tennessee, The University of Tennessee Medical Center, our residents are provided with excellent and plentiful learning opportunities year-round. Within the first two years of clinical anesthesia, a resident can easily achieve nearly all of the required case numbers necessary for graduation. 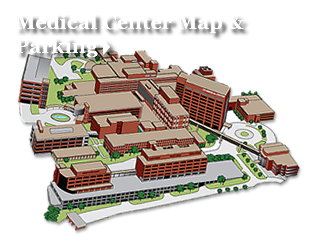 Pediatric experience At the University of Tennessee Graduate School of Medicine (UTGSM) consists of pediatric cardiac, trauma, and neonatal surgery. The UTGSM experience is complemented with a two month rotation at Vanderbilt Children's Hospital for pediatric anesthesia. The faculty is dedicated to education. Resident feedback is acknowledged and reflected in the educational structure as it has evolved over the last several years into an excellent combination of clinical practice and didactics. Research opportunities abound, and dedicated research staff members are committed to bringing your ideas to reality. The camaraderie and collegiality among residents and faculty is exemplary. Some of our residents choose careers in private practice, while others have had no difficulty in obtaining excellent fellowship opportunities. The Anesthesiology residency training program is a 4 year, categorical program, beginning with a Clinical Base Year. 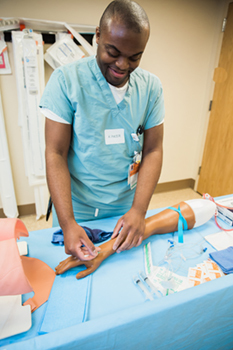 The Clinical Base Year emphasizes direct patient care responsibility and development of basic clinical skills necessary for success for virtually any clinical pathway. Upon successful completion of the Clinical Base Year, residents are oriented to their 1st clinical anesthesia year with a gradual introduction to the specialty of Anesthesiology over a period of one month. Residents then begin basic rotations in clinical anesthesia before moving on to more advanced rotations and electives during the 2nd and 3rd clinical anesthesia years. Graduates of this training program are confident, experienced and truly ready for whatever challenges they encounter in this field of medicine. Many continue their training in fellowships at other institutions such as the University of Pennsylvania, University of Washington, University of California-San Francisco, Vanderbilt, Emory and Duke. The rest enter private practice in the Southeast or scattered across the United States. Since the majority of the surgical staff at UTGSM are physicians in private practice, graduates are uniquely prepared to make the transition from residency training to private practice. All applications to the program must be submitted using the Electronic Residency Application System (ERAS). Interviews are conducted in November and December each year. Candidates selected for an interview will be notified via email. The following table represents the actual number of cases performed by residents during the 2016-2017 academic year.